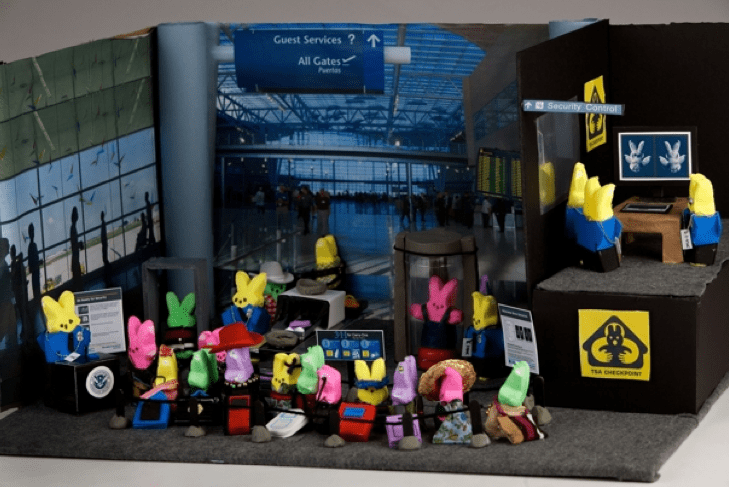 — the Washington Post is also running a Peeps diorama contest. Notice the Peeps being peeped at by security Peeps on the naked-Peep scanner (top right). Update: The contest is over, it seems. Although the winning entry was based on the rescue of the 33 Chilean miners, the TSA diorama above was one of five official finalists, which is saying something given that the Post says it received 900 entries. In the reader poll, this one is currently No. 7, but the No. 1 entry there also features the TSA, depicting a bunny pat-down. (I personally also like the undead bunnies in "The Walking Peeps," currently at No. 25.) If, as the Post suggests, the contest can be seen as a "social barometer" of what's in the public consciousness, then maybe this is at least a little more evidence that people are getting fed up with the hyper-security nonsense.